Read and talk about the Bible story daily. * Try these All About Me ideas from Preschool by Stormie. * Choose one or more Jesus Loves the Children activities from MSSS Crafts. 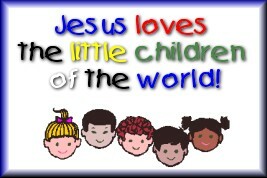 * Sing Jesus Loves the Little Children from Sermons 4 Kids. * Show the children how to turn a somersault. * Set up a "Somersault Road" by lining up pillows and/or couch cushions in a row. Have the children take turns somersaulting down the road. * Try some of these Number Activities from Preschool by Stormie. * Make a Number Chart: Have each child put the corresponding amount of stickers next to it's number. * Make a Penny Book: Do a crayon rubbing of pennies on a page with it's corresponding number. * Play with Mr. Potato Head and talk about the body parts as you use them. * Sing Head, Shoulders, Knees & Toes, Do Your Ears Hang Low?, The Elephant Goes, and Open, Shut Them. * Try some of these Body Awareness activities from Preschool by Stormie. * Draw with white chalk on dark paper. * Make a White Collage gluing on bits of white lace, ribbon, fabric, etc. * Squirt some shaving cream on the table or sliding glass door for the children to play with. * "S" words to build on: star stickers, squares, sunflower seeds, string, straws, stamps, spools, spoons, shells, scoops, sun, socks, sand. * "T" words to build on: triangle, tooth, truck, tie, tail, TP tubes, tins, toys, toothpicks, tape. * Make a capital S with white glue and sprinkle with sand. * Letter of the Week: S, T.
I had a brainstorm. First I printed up some giant Ts. I gave the kids some masking tape to make upper and lower case Tts. Then I gave them pieces of tape that they were able to shape any which way they wished. The preschoolers' sculptures didn't look like anything more than a wad of tape. The older school kids enjoyed making snakes, toads and other creatures. The only thing I had to do was tear pieces of tape as fast as I could and hand it out. I would not have had to help the older kids with tape if I had more roles. You can buy masking tape for near nothing at the dollar store. * Make a "Shape Mobile" by cutting shapes out of construction paper, tape different lengths of yarn to each shape, then tape to a wire hanger (careful to distribute the weight). * Print the Bible words, "God would keep his promise." Hebrews 11:11, on rainbow color sheets and other crafts. Repeat the words out loud as much as possible.